This study was designed to investigate the influence of dry air roasting (140, 160 and 180 °C for 5 and 10 min) and extraction methods (solvent and mechanical) on peanut oil quality characteristics. Oil yield, oxidative stability index (OSI), radical scavenging activity (RSA), and Maillard reaction products were increased while peroxide value (PV) and conjugated dienes were decreased in oil of peanuts roasted at 180 °C for 10 min. Oils extracted mechanically from roasted peanuts had lower PV while higher OSI and RSA than the solvent-extracted oils. The fatty acid composition of oils from roasted peanuts (at 160 and 180 °C for 10 min) changed slightly compared to unroasted peanuts. 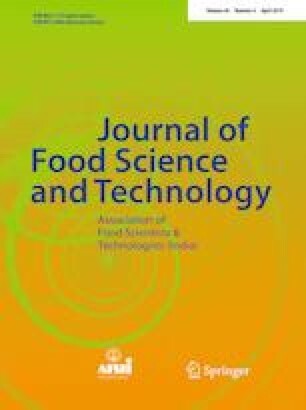 The level of 5-hydroxymethylfurfural and non-enzymatic browning index was significantly increased in oil from peanuts roasted at 180 °C for 10 min. FTIR spectra showed a slight change in peak intensities with no observed peak shift in oils extracted from peanuts roasted at 180 °C for 10 min. Based on the results obtained, mechanically extracted oil from peanuts roasted at 180 °C for 10 min improves oil quality characteristics and enhances oxidative stability. The authors gratefully acknowledges DST-SERB project (SB/EMEQ-037/2014) and SERB women excellence award (SB/WEA/09/2017) for providing financial support in the form of the research projects.